Presenting some of the most scintillating pictures from around the globe in the last 48 hours. 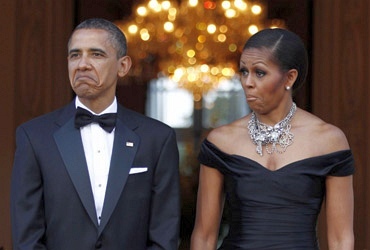 United States President Obama and first lady Michelle Obama react as car carrying Queen Elizabeth arrives in London. 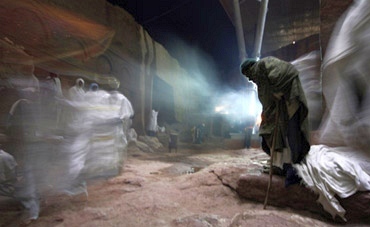 A Christian Orthodox faithful stands outside Bet Medhane Alem rock church in Lalibela. According to legend, angels helped King Lalibela build this church and others like it in the 11th and 12th century after he received an order from God to create a new Jerusalem in Ethiopia. 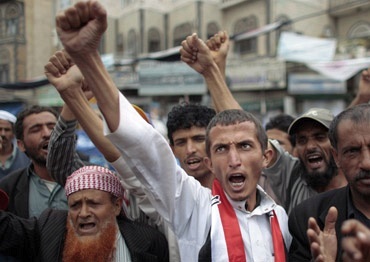 Anti-government protesters shout slogans during a rally to demand the ouster of Yemen's President Ali Abdullah Saleh in Sanaa. 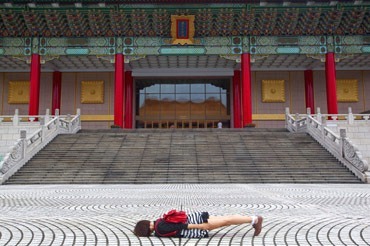 Karren, part of the Pujie Girls, poses for a photograph while demonstrating planking outside Taiwan's National Theatre in Taipei May 25, 2011. Lying face flat on the ground may not be the world's most glamourous photo pose but two Taiwanese "planking" women have made a name for themselves on the Internet, and hope to use the craze to spread positive social messages. Calling themselves the Pujie Girls which literally translates to "falling on the street" in Mandarin, the pair are Taiwan's most well-known plankers, with almost 100,000 fans following them on Facebook. 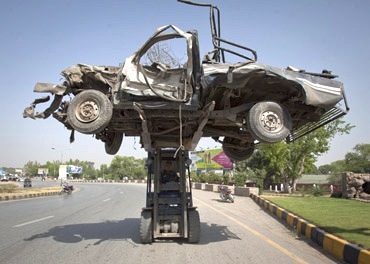 A damaged vehicle is cleared from a police station, which was destroyed by a car bomb, in Peshawar. Suspected militants drove a car packed with explosives into the police station in the Pakistani town of Peshawar on Wednesday, killing two policemen and wounding 20 people. 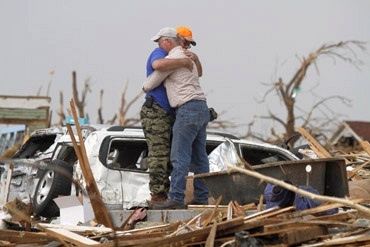 David Vanderhoofven (R) is comforted by Dan Regouby, as they stand where Vanderhoofven's home used to be, in Joplin, Missouri. 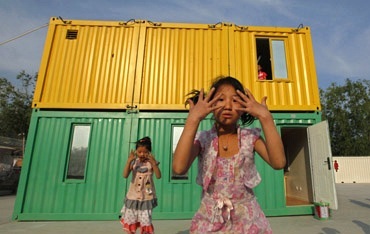 Children of migrant workers dance outside containers used as classrooms during an after-school program initiated by Compassion for Migrant Children in Beijing, China. CMC is a nonprofit organisation founded in early 2006 to help China's urban migrant children, primarily through offering social and educational programs. 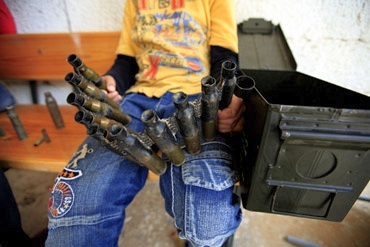 A boy displaced with his family by fighting in Misrata, Libya, holds empty ammunition shells as he plays war games at a special needs school. 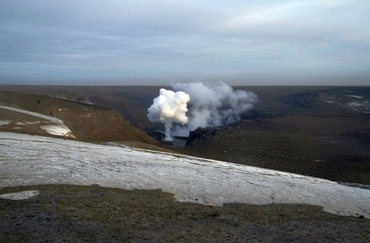 Picture shows smoke from the Grimsvotn volcano, under the Vatnajokull glacier in southeast Iceland. The Icelandic volcano which disrupted hundreds of flights in northern Europe is no longer spewing out ash and the eruption seems to have halted. 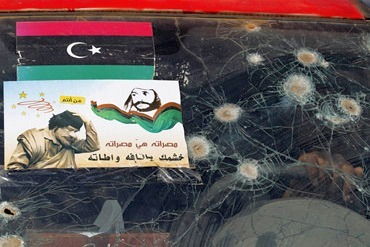 Bullet marks and a poster showing a defaced Muammar Gaddafi are seen on a Libyan rebel fighter's car in the eastern outskirts of Misrata, Libya.